As a Constitutional Democracy, South Africa accords and protects certain rights to all of its citizens. In South Africa, the month of March is deemed as a Human Rights month, with the 21st of the month as a day when the country celebrates the triumph achieved by the women who marched against the apartheid pass laws in 1960. But during the month of March, other forms of victory are celebrated. 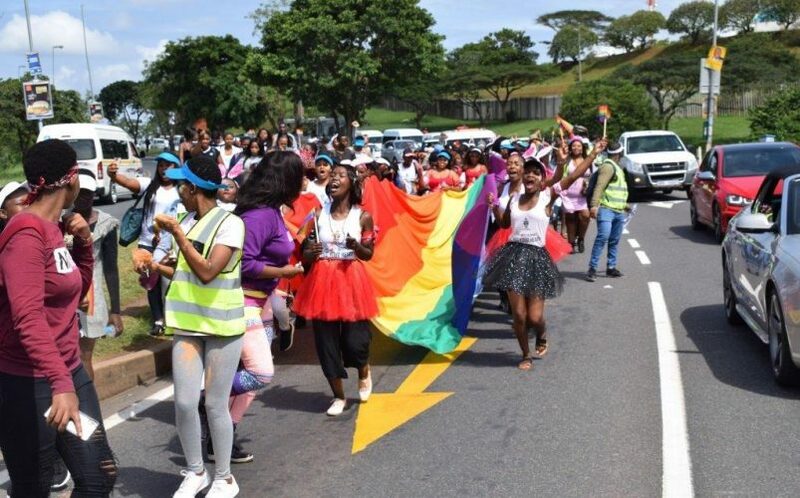 On 27 March 2019, MUT had a Rainbow Parade aimed at promoting tolerance and acceptance of people living with disabilities, albinism and members of the Lesbian, Gay, Bisexual, Transgender, Queer or Questioning and Intersex (LGBTQI) community. Jade Mthiyane, Events Co-ordinator at the University’s Department of Marketing and Communications, said “We wanted to highlight the fact that MUT is a University for everyone. We would like to see all the differences – cultural and sexual, celebrated at MUT. We advocate for acceptance of the differences as was mentioned by the Vice-Chancellor, Dr Enoch Duma Malaza last year during his series of meetings with staff when he was promoting his Strategic Plan 2020-2025. Mthiyane added that as the Department of Marketing and Communications, they wanted to create an atmosphere that would support all the students’ academic and social life activities in their time at MUT. Luyanda Mchunu, a third year Marketing student said celebrating the rights of the LGBTQI at MUT meant a lot to him. “When I joined MUT I did not think that the University would be welcoming to people like me. I would like to see this day being celebrated every year. The parade gave everyone a chance to show who they are, without them saying anything negative,” said Mchunu. The parade, which was well organised, started from the University’s main gate at 11 am, snaked out into Mangosuthu Highway, towards the Faculty of Natural Sciences, and turned around at the Umlazi Comtech and headed for the University’s sports grounds, via Inwabi Road. At the grounds the parade settled down for a picnic and got more than a mouthful of information. The University’s Clinic gave students health-related information. “We are available to all of you to assist you test for your health status. Our main focus is on sexually transmitted infections (STIs). But there are also other services that we offer,” said Cebi Nkosi, HIV/Aids Counsellor at the Clinic. Students also received prizes for taking part in the entertainment, and responding to questions. What was most heart-warming was that the day was supported by students and staff, an indication that MUT is an open-minded community. Mchunu said they would like to have a formal structure as LGBTQI students.